Native American delegation honors the memory of murdered and missing girls, women and LGBTQ individuals. Yolanda Francisco-Nez’ voice grew faint as she recounted the story of a Navajo woman whose body had been found a day after she left her Southern Utah home in November 2015. Her attacker left her body under a tree. She’d suffered a gunshot wound to her head, Francisco-Nez recalled. A rope had been placed around her neck. 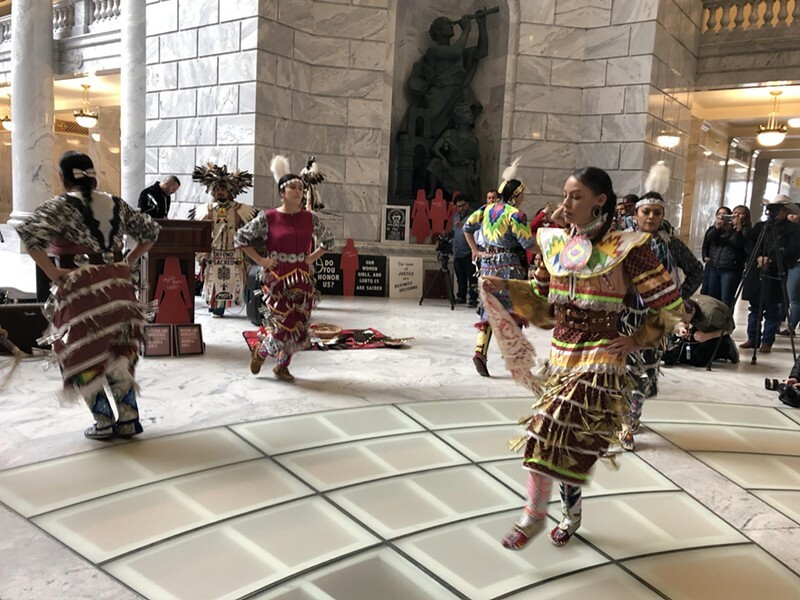 Francisco-Nez, the executive director of Restoring Ancestral Winds (RAW), was among a group of speakers who met in the Capitol rotunda Monday to remember the lives of indigenous women and girls who’ve gone missing or have been murdered in Utah. 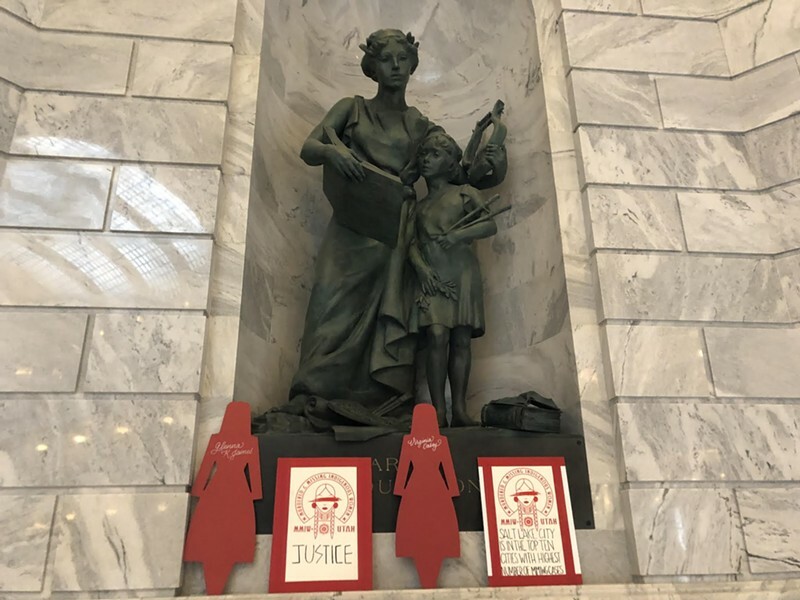 Touting a report released last year that pegged Salt Lake City among the top 10 U.S. cities for murdered and missing indigenous women (MMIW), girls and LGBTQ, the speakers encouraged lawmakers and the public to recognize the people who have been affected by the ongoing violence. Performers danced and sang in between each speaker’s short address. Michael Gross, from the Northwestern Band of the Shoshone Nation, performed an original song. Several dancers took part in a healing dance, livening up the Capitol with rolled-up tobacco can lids pinned to their garb that jingled as their bodies moved in unison to the recording of a drum. And Crystlll Bluewater Sapphire gave a drag performance, lip synching as a few members of the small assemblage enthusiastically cheered. Kicking off the Legislature's second week, RAW’s tribute was a part of the day’s Native American Caucus Day on Capitol Hill. Earlier that day, Sen. Jani Iwamoto, D-Holladay, presented a concurrent resolution on the Senate floor that recognized the Navajo Code Talkers for their contributions to helping the U.S. win World War II. The multilingual heroes used the Navajo language to transmit messages to front lines, command posts, aircraft carriers and battleships, as well as to landing units involved in the major invasions in the Pacific during WWII. “The Navajo Code Talkers leave a legacy of service, continuing to inspire others to achieve excellence and instill core values of pride, discipline and honor,” Iwamoto, who has also sponsored a bill that would dedicate portions of state highways to the Code Talkers, said. The resolution designates Aug. 14, 2019, as Navajo Code Talkers Day in Utah. Rep. Angela Romero, D-Salt Lake City, gave short remarks at the MMIW tribute. She reminded the crowd that 71 percent of Native Americans live in cities, not on reservations, before mentioning that lawmakers should create a task force in next year’s legislative session to deal with the issue. “We want to make sure that all voices are represented, and nobody is left out of that conversation,” Romero said. 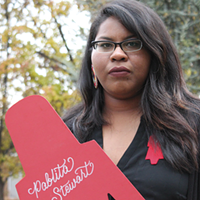 Romero proposed a resolution recognizing May 5 as Murdered and Missing Indigenous Women Day in Utah. “I don’t really see any opposition to it, but you never know,” Romero said. “Native voices, many voices of women of color, are often not heard, or there’s nobody to speak out for them because the majority of times, we’re not here in the halls of a state Capitol. That is my obligation and my duty to make sure that those voices are represented, and they’re not silenced,” she finalized. 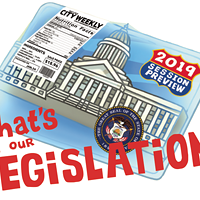 Our annual look at the rip-roaring 45 session days ahead. A new report attempts to document the number of Indigenous women missing or murdered in 71 cities across the U.S. According to its data, Salt Lake City ranks in the top 10. How one local Native American-led activist group is giving a voice to their missing and murdered Indigenous sisters.